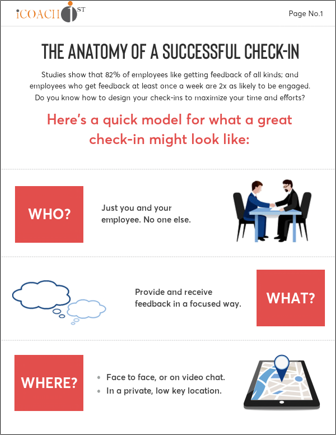 Do you know to design your check-in to maximize your time, effort and impact? The nightmare scenario for any coach or manager is working hard to help develop employees and still seeing no progress, or worse, seeing them become more and more disengaged. In our infographic, 7 Nightmares That Scare The Heck Out Of Managers (and what to do about them), we explore seven common situations managers find themselves in and what to do about them. To read more about how to deal with nightmare coaching scenarios, download our eBook, War Stories From The Coaching Trenches: Survival Advice For Managers and Coaches. There are a lot of studies on feedback in the workplace, and together, they can be startling – because they often seem contradictory. We want more feedback, and in particular critical feedback, but we are also stressed out giving and receiving feedback. When we get feedback right, it can make a huge difference driving engagement, retention and productivity. Stop the madness – It’s time to change the way you manage performance. If only 1 in 5 employees feel their performance is managed in a way that motivates them to do outstanding work, then why do we continue to employ outdated practices? Now’s the time to modernize your performance management processes to promote greater employee engagement, motivation, and productivity. In our new infographic, 12 Compelling Reasons to Change Your Performance Management Practices, we help you diagnose organizational pain points and create a business case for change. What’s more effective, positive or negative feedback? Let us help you grow your investment in people. © 2017 iCoachFirst. All Rights Reserved.